When looking to complete any major home improvement project, it’s important to research options for professional contractors. While there are many options to choose from, many custom deck builders might not meet all your desired criteria. This is why research is important. You can gain more insight into comparing contractors or going the DIY route on our Choosing a Deck Company page, but when selecting an Omaha custom deck builder we encourage you to look at longevity, level of expertise (through previous work and clients) and quality of building materials. Doing diligent research will pay-off with a beautiful custom deck that will last years to come. 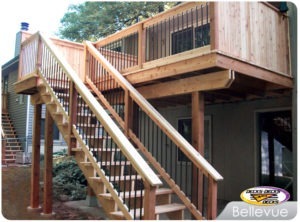 This entry was posted in Custom Decks Omaha and tagged custom deck builder omaha, custom deck omaha, deck contractor, low-maintenance deck on February 27, 2015 by Decks, Decks and More Decks.